Mohonk Mountain House Garden Manager Andrew Koehn has the two qualities I appreciate most in a fellow horticulturist—passion and irreverence. He gets excited talking about his concepts for the Mohonk show gardens, but he also eschews some sacred horticulture cows. When I asked him for his approach to designing for "winter interest" with evergreen foliage, persistent ornamental fruit, or decorative seed pods, he laughed. Koehn says, "When we get our first blizzard or ice storm in December that covers everything, I say 'Look, winter interest!'" Koehn's passion for gardening began at age nine, nurtured by grandparents who gave him plants. "I knew at a young age that this was the field I wanted to go into," he days. "My Dad thought I was nuts when I asked for a greenhouse for my 16th birthday, but he built me one." 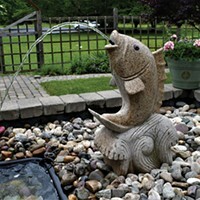 He went to SUNY Cobleskill and got his associate's degree in ornamental horticulture. Floral design was one course requirement; Koehn took to it and after college, he worked at a flower shop for several years. When that business closed, he went to work doing residential landscaping in the Woodstock area until 1994, when he began five years as the community horticulture program assistant for Dutchess County Cooperative Extension. Periodically, Koehn got to speak on panels with then Mohonk superintendent of grounds John Van Etten, who in 1999 called Koehn and said, "I have a couple of gardener positions open. Can you suggest anyone?" Koehn ruminated a bit and said, "How about me?" 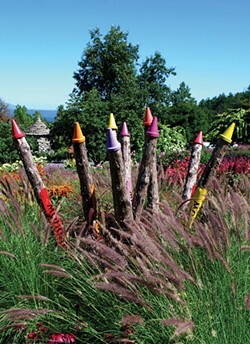 The 2013 show gardens theme at Mohonk was “Box of Crayons." 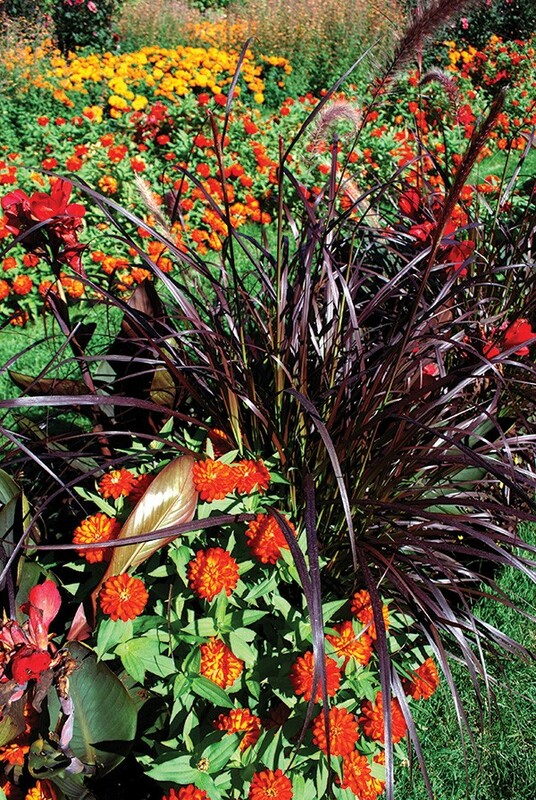 One of Koehn's most exciting opportunities came in 2005 when the show gardens, the 75 central beds that feature colorful annuals, were turned over to him. Each year he comes up with increasingly ambitious planting schemes for which he still must find simple descriptive themes; in 2013 Koehn came up with the "Box of Crayons" motif after a key conversation with an intern. 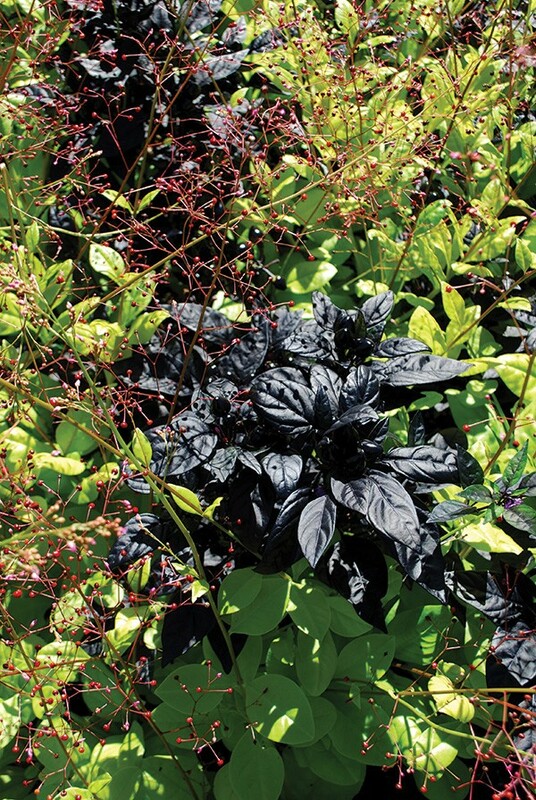 Koehn says, "I so frequently get asked by guests, 'What's new in the plant world?' I had decided to plant 45 of the 75 beds with new varieties of annuals. Our intern said, 'You need to organize the colors in some way so there's some thread the garden visitors can follow.'" Koehn came up with "Box of Crayons," with eight colors in the typical crayon box, including black, brown, and white. He knew they needed some simple props to make the motif work, so he had larger-than-life crayons made to mark color zones. Some beds were plays on one color, but intervening beds played with complementary color combinations, and color zones jumped the paths so that there would be a sense of cohesiveness (indeed, the paths seemed to disappear). As one turned one's head, one could take in brown with pink (one of Koehn's favorite combinations), then pink with purple, then purple with yellow, then yellow with orange ... each view was of a different pairing in a seamless series of segues. So: simple-sounding theme, but sophisticated design strategy. 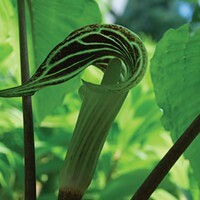 Photographer Larry Decker and I wandered around slack-jawed, experiencing the intended awesome impact of the garden. 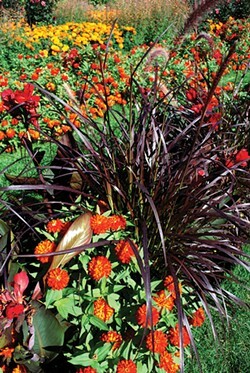 Mohonk’s Koehn likes the contrast of red flowers and dark foliage. In addition to the fabulous Box of Crayons show gardens of 2013, Koehn has overseen the installation of a perennial Blue Border and White Border. I asked him what makes such monochromatic plays on color—and other facets of color selection—successful. "Look at your foreground and your background before you pick the color scheme. For instance, white borders don't look good against white houses, they look good against dark houses or green foliage. And the prettiest white border in the world does not look good unless it's adjacent to a green lawn. It's gotta be framed." If using blue in a monochrome border, Koehn says, "Blue gets lost in overly sunny or open spaces; find a partly shady situation and again, think about framing." "Be careful with red. It's a great color but it startles people. It's not something that people look at for long. It helps to use dark leaves in contrast to the red." 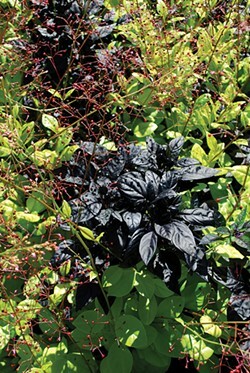 (Koehn used a lot of red flower/black foliage combinations in the Box of Crayons garden). "Or a red border doesn't have to be as large as a blue, white, or purple border. Likewise, yellow is a color you have to use strategically. A little yellow goes a long way." "If you have a small space, keep the color palette simple so you don't end up with confetti. Pick at most a trio of colors that are complementary on the color wheel to play with. Group colors, don't dot them." "Play with form; so let's say if you're doing a small, yellow-themed garden, mix up the forms, like billowing yellow daisies contrasting with spiky yellow snapdragons, or with a plant with yellow fruit, like a yellow ornamental pepper. There's much more to a plant than a flower." More foliage play, with chartreuse and black. 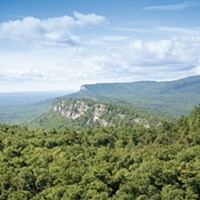 What would surprise people about gardening at Mohonk? There is very little soil here. This is a garden built into the side of a mountain, on shale. Because of this, the woodland trees that you see that are 100 years old, they're only 40 or 50 feet tall at best. Trees struggle to grow here and snow and ice storms do a lot of damage. The grounds and gardens have a smaller staff than folks might realize—at high season we have ten people: three in the greenhouse, two full-time gardeners (including myself), one full-time groundsperson, two seasonal gardeners, and two seasonal groundspeople. There are about 30 acres of maintained grounds and gardens. We are busy in the winter, too, as we do the Christmas decorating for the house, but also winter is a critical time for the full-time staff for evaluating and planning, and for propagating plants. How do you handle the deer? We use repellents vigilantly—twice a week when plants are growing. Repellents work, but you can't let up, since the plants outgrow the repellent. (Rain is not the issue, as most repellents are mixed with a good tackifying agent, or "sticker.") Hostas and hydrangeas are easy, because they come up and sit there—you can spray them once every two weeks and be fine. But petunias and other annuals outgrow what you spray in just a couple of days. We don't refrain from planting anything based on deer preferences, but we do strategically place those favorite plants—i.e., it's good to have all your "deer food" in one place. It makes it easier to spray with repellent. Then to protect tulip bulbs (we plant thousands every year) from being rooted out by deer or other critters, we plant them in a concentrated area and cover the beds with deer netting (1" mesh), pinned down. In the spring we take the netting off before the new foliage could be damaged and immediately start our repellent-spray regime. What are some of your personal horticultural passions of the moment? I'm into tuberous begonias, orchids (especially Lady Slipper orchids), and delphiniums, which intrigue me with their height and scrumptious flowers. Delphiniums are finicky but worth it. I'm also really into designing next year's show gardens; the theme will be "South of the Border." There will be a lot of terra cotta, dramatic large succulents, dahlias (Mexico's national flower), striped flowers and solid hued flowers planted in stripes, and tons of ornamental peppers. Come see it!